TubeNet • View topic - A Kaiser is born! Re: A Kaiser is born! 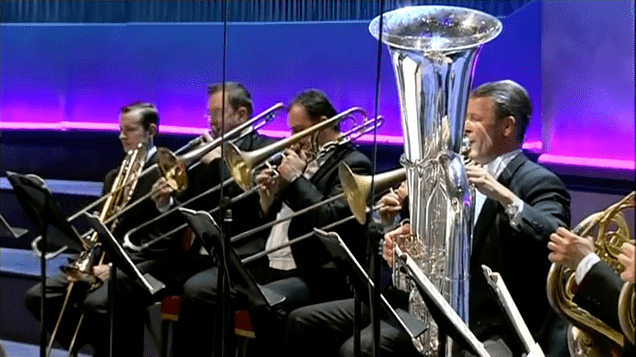 I've personally never encountered any tubas of this style (in C length) that were easily playable in tune. Those "Kaiser" rotary instruments "live" in Bb, just as do baritones, euphoniums, and trombones. Further, most professionals leave their Bb trumpets "stock" (as they are satified with them), but monkey-around and monkey-around and monkey-around with their C trumpets (again) trying to get them to play as they need them to play. Only (can we talk?) have a few easily-playable-in-tune C tubas been (finally) introduced to the market (any size range) in the last couple of decades, as (finally) some designs are based on "starting over", rather than being factory cut-downs of Bb designs. Why (before even playing the Bb version) demand a C version? The Miraphone 98 (a different style of very large rotary Bb tuba) absolutely rocks, YET (as soon as it was introduced and displayed) people were asking "what about a C version?" I like Mark a whole lot, but I'd like to see him play/evaluate what's being offered prior to asking about something else. Why am I participating in this thread? I see the possibility of something that is actually useful (not some gimmick) and not just "another knock-off of the same ol' thing". I see this product as potentially USEFUL (and not a gimmick), just as I see the 6/4 compensating BBb as potentially USEFUL (a broader - and fully-chromatic - "bass" sound in a brass band or in a wind band). The developer's consideration of a "German-made rotors" option creates even more interest. Currently (based on my experiences) there is one builder in China that manufacturers consistently satisfactory rotary valve assemblies...and its stenciled brand names neither begin with a Ea nor Ya. I just like rotary horns more than piston, no matter what the key. Just like the Hagen (my favorite Miraphone offering) I'd like the see that playability, tone, and (if possible) intonation be applied to a CC tuba. Mark Finley wrote: I just like rotary horns more than piston, no matter what the key. 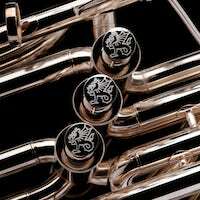 Just like the Hagen (my favorite Miraphone offering) I'd like the see that playability, tone, and (if possible) intonation be applied to a CC tuba. Understood. I know how you feel on those matters, personal preferences notwithstanding. I would actually apply what Joe said to those people who have the automatic knee-jerk, conditioned response (based on CC snobbery/brainwashing) of “will it be/it should be in CC.” The “inferior” BBb is not worthy of consideration. Doesn’t even enter their realms of possibility. CC elitism is alive and well with some. Maybe we can take turns with it at TMEA and compare notes, make honest assessments. And the 496 is the bomb. I want to try the 497. And I certainly want to try this tuba. The bell flare shape is more radical, whereas the new Chinese instrument's bell flare shape seems to represent a significant compromise towards normality...which really doesn't matter, if it ends up being a great tuba. A smaller bell flare version is in the works. It'll be called the Kaiser Presence. Ken Crawford wrote: A smaller bell flare version is in the works. It'll be called the Kaiser Presence. Call the big one the Kaiser Wilhelm. That way I can feel like it's my own personal signature model. Mark Finley wrote: The cerveny 601 and the Neptune are very close, of course I have a 601 that I love, so it would take a lot to get me to change. I'm surprised that Jonathan (former tubenet name "neptune") has not brought a neptune to the marketplace. He's obviously a fan. And this isn't meant as a slap to his business practices, but with all of the Niche instruments he's had built and brings the to the marketplace, a Kaiser Rotary CC tuba is where he draws a line in the sand??? I did say (or at least mean) not a CC version of this Kaiser tuba (because we don’t think it suitable for such key conversion) - not that Wessex will never do a rotary valve 6/4 CC of any design. Finding how much better the Wessex Chicago plays than even my special handmade Neptune, I would be far more inclined to use a York style body for a rotary valve CC if that proved possible - but it is not imminent - there are quite a few other planned developments to complete before even considering. Is $9,500 considered a budget horn these days? doublebuzzing wrote: Is $9,500 considered a budget horn these days? Compared to $16K-$20+K hand-hammered tubas from European manufacturers, then yes. Yes, it is. I’ll take a smaller 5/4 and call it the Kaiser Willy!! I've seen it. Checked the bank account, cried a little, then got over it. Four-out-of-four times, when I've purchased beautiful "restored" European-manufactured instruments from European eBay sites, they were only cosmetic restorations, sported many critical issues (which required ruining their cosmetic restorations in order to address, and - most importantly - ALL featured WORN-OUT VALVES (and linkage). This is also most often the case when people bring me their eBay-purchased American (cosmetic) restorations...i.e. WORN-OUT VALVES (and buffed-too-thin bows)...which is why I no longer accept such instruments for repair (at least, not shipped to me from afar). Think of a gorgeous 1930's Roadster with a beautiful body and interior...but with a hopeless engine, transmission, and differential...oh, and with ill-fitting doors and fenders, which need to be taken off, altered, and repainted. One reason that I don't restore a bunch of instruments and sell them is because so many "candidates" are crap, there isn't enough left to "put back", and those "restorations" would end up (not only with me being stupid-upside-down, labor-wise, but also) with significant percentages of those instruments being non-original. For those who wanted the dimensions of the Kaiser, the bore is 21mm (0.827”), bell 450mm (18”) and height 1148mm (45”). And to clarify we are not planning on making with different size bells. Here is the Kaiser now silver-plated being play tested by me. BTW Although a huge tuba, it only weights about 23lb due to being all hand-hammered from sheet brass. Wyvern wrote: Here is the Kaiser now silver-plated being play tested by me. Will Carl get this at any point Jonathan, I'd like a try! How’s the rotary valve click-clack? Any improvement? MikeMason wrote: How’s the rotary valve click-clack? Any improvement? Earlier, I believe (??) it was indicated that a possible option would be either a German valveset or partially German valveset. Last edited by Wyvern on Sun Aug 26, 2018 1:34 pm, edited 3 times in total.